Does Leeds City Council care about dangerous taxis? 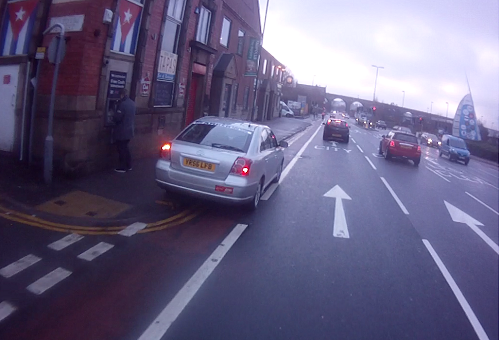 On my commute into Leeds I regularly observe taxis parking in the cycle lane, and sometimes on the pavement, outside the Tapas bar on Kirkstall Road in order that the passenger can use the cash machine (photo from 14th Feb this year). This obstructs my passage and means I have to move out into the carriageway - which is very busy and moving at speed. The cycle lane is mandatory and road marked with double-yellow lines. Parking on the pavement I believe to be illegal. Read more about Does Leeds City Council care about dangerous taxis? The Adelphi, 7.30pm, Weds 10th April. The first official meeting of the Leeds Cycling Campaign will be held in The Adelphi Hotel (http://www.theadelphileeds.co.uk/) in Leeds. We have an upstairs room which will be ideal for combining a dedicated space for discussion with rapid access to the bar. Read more about The Adelphi, 7.30pm, Weds 10th April. Following a “Go Dutch” workshop hosted by transport planners from the Netherlands, Mark Robinson described a possible approach to Regent St. Mark reported the workshop had recommended “build stuff” – the attendees had asked about training and awareness and the Dutch had said “build quality stuff” – that’s more important. The proposal for Regent St is a “hybrid cycle lane” which would have on-road sections, with priority over side streets, and where no side streets exist, shared use on pavements. Detailed survey information should be available shortly. At a recent Cycle Consultation Forum subgroup, Mark Robinson revealed new plans for a cycle controflow along Cookridge Street into the city centre. This will help cyclists travelling from the University and Millennium Square towards the railway station. New Generation Transport (NGT) is the trolleybus scheme that is the latest in a series of proposed “rapid transit” schemes for Leeds. A better way to change behaviour? On yesterday morning's commute I was honked by a car driver who passed close by whilst gesticulating offensively at me with his hand. I was cycling at the left hand side of the main carriageway at the top of the hill descending south on the A65 from Horsforth. Read more about A better way to change behaviour?